Scott Morrison made the pilgrimage to Texas last year to visit Exxon bosses. The then Treasurer might have prodded them to pay tax in Australia, but no, at that point he was trying to shove through his package of corporate tax cuts and was there to see how Donald Trump’s tax policy was faring. Fast forward a year and Exxon has failed again to pay income tax in this country. The Tax Justice Network’s Jason Ward has been analysing Exxon’s tax chicanery for years. Here he lifts the veil on an extraordinary corporate labyrinth. WHILE THERE continues to be much focus on the tax dodging of the global tech giants, these newcomers learned the tricks from the old masters. ExxonMobil, and its predecessors stretching back to Standard Oil, take the cake. ExxonMobil’s tax dodging in Australia is part of a much bigger heist from governments around the world. Exxon is stealing funds needed for essential public services such as schools, hospitals and social services in dozens of countries. 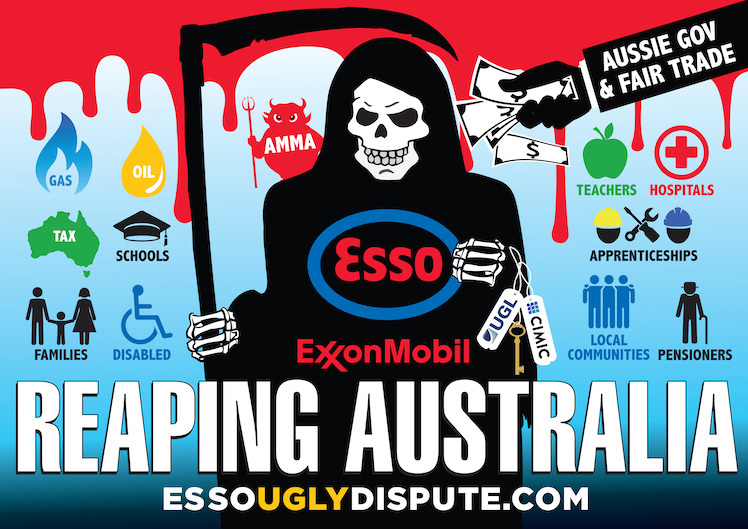 In late December 2017, Australian newspaper headlines claimed that Exxon was the “poster boy” for corporate tax dodging, with $25 billion in revenues and not one cent in corporate income tax. Exxon was also embroiled in a bitter dispute with its workforce (and still is), after cutting workers’ wages at the Longford Gas Plant by over a third. Workers on contracts, that is. This plant – via the Bass Strait offshore oil and gas fields – is the largest supplier to the domestic gas market. While consumer prices have skyrocketed, the government has threatened using a “big stick” to bring price relief. But this supposed big stick of government energy policy delivered a very soft poke. Thankfully, Australia was spared much further lecturing from Treasurer Scott Morrison and the Liberal Party about the incredible benefits that a corporate tax cut in Australia would bring to all Australians. The Party subsequently abandoned its core economic policy. The notion that benefits would trickle down to the rest of us when Exxon and others got tax breaks was put on the shelf. Meanwhile, Exxon’s tax dodging in Australia received further exposure through a Senate hearing when the public discovered that Exxon was in the middle of an eight-year tax holiday and did not expect to pay any corporate tax until 2021. Exxon also admitted – which it had failed to reveal to a previous Senate hearing although specifically asked – that the Australian business was owned by shell companies in the Netherlands, the Bahamas and Delaware. Exxon executives denied that this structure had any impact on tax paid in Australia. However, they could not explain what purpose the tax haven shell companies served and why it was set up that way. Exxon executives did provide a corporate structure of operations in Australia, but they have continued to mislead the Australian Parliament by failing to provide the full picture. Exxon operates a large scale liquefied natural gas (LNG) project in Papua New Guinea called PNG LNG. This massive project is owned through another Australian company, Mobil PNG Gas Holding Pty Ltd, which is owned by Exxon Overseas Investment Corporation in Delaware. 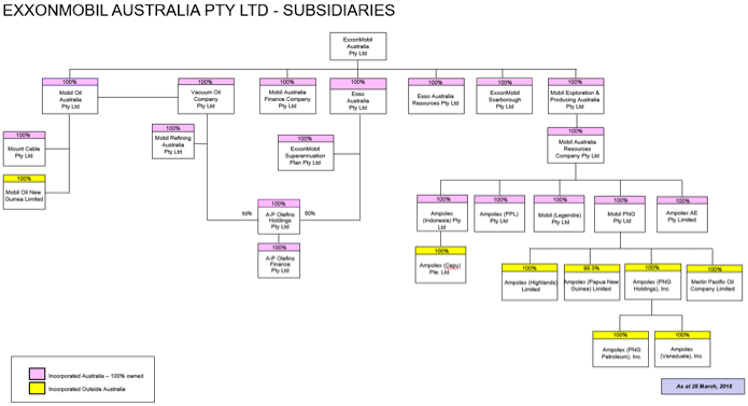 This is one of the two Delaware companies that indirectly own the primary Australian subsidiary. Exxon’s PNG ownership structure bypasses the Netherlands and the Bahamas but connections to the Bahamas run deep. Exxon executives failed to reveal the Australian ownership of PNG LNG when specifically asked by Australian Senators at a hearing of the Parliamentary Inquiry into Corporate Tax Avoidance. ATO corporate tax data for 2016-17 shows that Mobil PNG Gas Holding Pty Ltd made tax payments in Australia of $284,849, exactly 30 per cent of taxable income of $949,497, and from total income of almost $260 million. Yet Exxon’s primary Australian company had total income of nearly $8.4 billion, paid no tax (in Australia) and recorded zero taxable income. 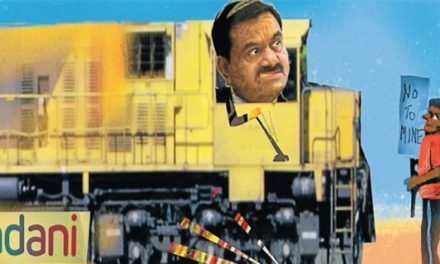 Questions have been raised by angry traditional landowners about the lack of revenue from the PNG LNG project’s massive exports. Exxon, in proportion to its project ownership, owns one-third of a Bahamas-based subsidiary, Papua New Guinea Liquefied Natural Gas Global Company LDC. This Bahamas company provides financing to the PNG LNG project and acts as the marketing hub for the sale of LNG to large customers in Asia. 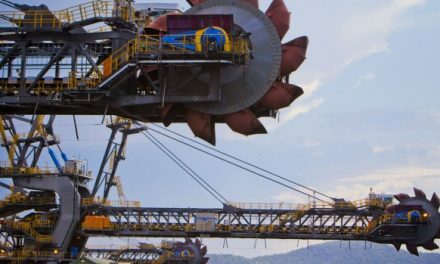 While the ATO has been cracking down on resource companies using Singapore as a marketing hub for the export of Australian resources, the use of the Bahamas takes this game to a whole different level. The PNG LNG project has production capacity of more than half of the massive Gorgon project, Australia’s largest resource project ever, in which Exxon also has a 25 per cent interest. It is estimated that annual revenue from PNG LNG in 2016, when prices were down, from only four Asian customers was nearly $US2.5 billion. The Australian company, Mobil PNG Gas Holding Pty Ltd, showed income tax payments in 2016 of $US7 million and $US1 million in royalties. There’s nothing like a tax rate of zero in the Bahamas to make sure that very little trickles down to the people of PNG. The ATO did issue amended income tax assessments for ExxonMobil Australia Pty Ltd in 2018 “following a review of financing structures and related party loan pricing”, but Exxon continues to contest those assessments. Rather than pay taxes, Exxon is likely to continue to add to the more than $10 million it has already spent in legal battles against the ATO. 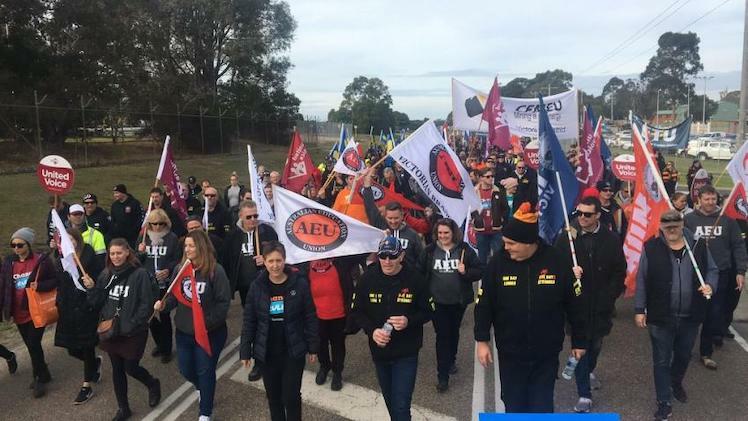 In true form, while Australian workers continue to walk the picket line and stand up to this corporate bully and refuse to accept pay cuts of 30-40 per cent, Exxon’s key Australian executives have bumped up their pay by 36 per cent to $9.9 million. Exxon needs to be held to account for attacking Australian workers, dodging taxes, misleading the Australian Parliament and screwing over the 8.5 million people of PNG, our closest neighbour, using an Australian shell company and a Bahamas marketing hub. Images below both from Exxon’s answer to Questions on Notice from the Senate Hearing. More details on Exxon’s tax dodging can be found here and here. Both were submissions to Senate Inquiry. Disclaimer: the author has been funded in the past by unions in dispute with ExxonMobile. The featured image for this story was provided by the Australian Manufacturing Workers’ Union. Jason Ward is Principal Analyst at the Centre for International Corporate Tax Accountability & Research (CICTAR). Ward has been a frequent commentator on corporate tax issues as an analyst and spokesperson for the Tax Justice Network – Australia (TJN-Aus). He is currently an adjunct senior researcher with the University of Tasmania’s Institute for the Study of Social Change. Over the last several years, Ward has conducted in-depth research on Chevron, Exxon, the Petroleum Resource Rent Tax (PRRT). This included two reports on Exxon tax avoidance to the Senate Inquiry on Corporate Tax Avoidance on which this article is largely based. Ward is the author of a 2018 TJN-Aus report on the tax practices of the largest for-profit aged care companies and a report on the tax practices of Serco and other outsourced service and labour hire corporations with large ATO contracts. You can follow the Tax Justice Network Australia’s blog here.